Most didn’t even notice her. Many overlooked her purpose. She was not strong like the bowstring cable or beautifully curved like the back of the bow. Nevertheless, she was a valuable part of the mighty recurve. 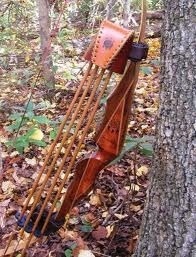 I am speaking of the quiver and this is her story. The quiver was proudly fastened to her magnificent bow which was held in the archer’s strong hand. The archer appreciated her; he understood the purpose of the quiver. He was the one who formed and fashioned each and every part of the bow. In his hands, the recurve with its arrows, was a powerful weapon and an unstoppable force. The archer knew the heart of his quiver. He knew she hoped that one day she would be full in number with unbent, accurate arrows, arrows that would fly free, purposefully hitting their target. She wanted to teach them and prepare them for the day of their release. The archer knew she would safely secure them until they were ready. All of this would happen one day, but today was not that day. Not long thereafter, to the quiver’s great delight, the archer placed and secured five arrows, one by one, inside her. Now, with her quiver full, she held fast to each of her arrows. The quiver loved each one of her arrows dearly and arrows returned her love. They felt secure in her embrace. She held tight to each one because they were her greatest treasure. She shared her dream with the arrows and told them of the archers mighty hands. She taught them about their magnificent bow. Not long thereafter, a strong hand picked up the bow and reached for the first arrow. It was the archer’s hand. Excitement welled up inside the little arrow’s heart because he knew his day had come to be released. But much to his surprise, the quiver held him fast and would not let go. “Today is not that day.” she told her arrow. The quiver was afraid. The archer was patient and understood the quiver’s fear. He waited for another day which quickly came to pass. When he reached to take the arrow, the quiver held even tighter. The quiver knew that he spoke the truth. Hope began to rise up in her heart again. She knew that she would never be at peace until she released them one by one. She trusted the archer, for he was her creator. His aim was flawless and his target before them. Today was that day, the day her arrows would fly. One by one, she let them go and watched with amazement as the archer released her arrows. Fear was replaced by faith. Happiness reigned instead of sorrow. Each arrow cut through the air with hairsplitting accuracy. The arrows were filled with rousing joy as they were released into their freedom and purpose, but no one was filled with more joy than the quiver. Even though her arrows were no longer fastened to her side, her heart would remain bound to them forever.